Ultrasonic cleaning systems are very efficient for the inline cleaning of endless materials such as wires, cables, rods and continuous profiles. To test the ultrasonic cleaning effects on your specific material and contamination, Hielscher offers a mobile ultrasonic wire cleaning test box. The ultrasonic wire cleaning test system is versatile and can be easily integrated into your production line. Different kind of materials and contaminations require a specific intensity of cleaning. 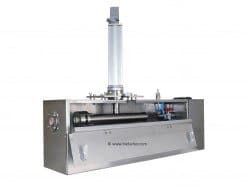 To evaluate the effects of ultrasound to the specific continuous material and the kind of residues, Hielscher Ultrasonics has developed a mobile wire cleaning test set (see picture below). 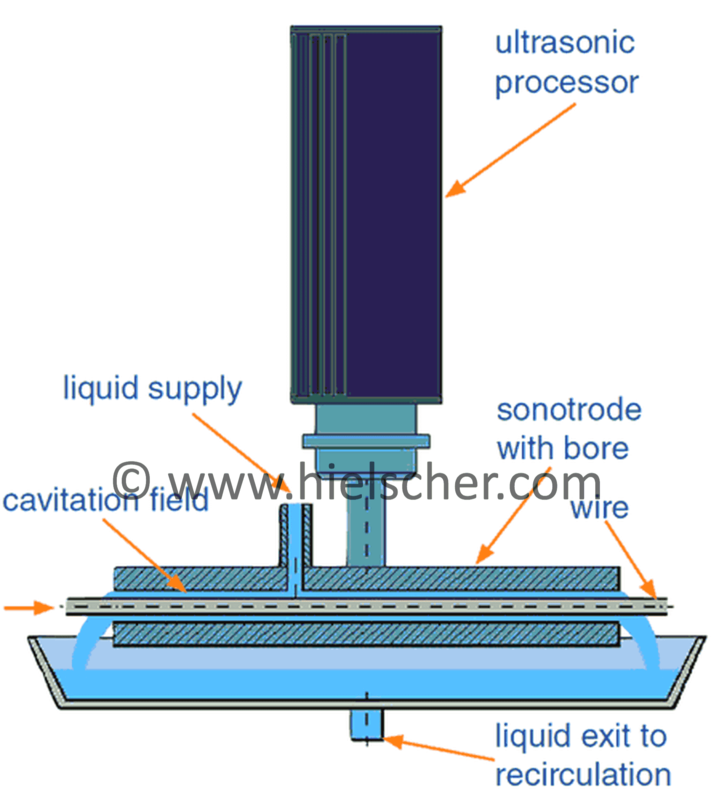 This allows for testing the ultrasonic effects to the specific material and the specific residues. As all results can be scaled up linearly, this setup is ideal for inline trials. The wire cleaning testbox can be easily integrated – directly into the customer’s production line. For sophisticated testing of the cleaning process as well as for the evaluation and optimization of the ultrasonic settings, Hielscher offers the use of its ultrasonic process lab. Long-time experienced staff of Hielscher provides in-depth consultation, training, and maintenance service. Click here to read more about ultrasonic wire cleaning and our various ultrasonic systems for inline cleaning! Ultrasonic cleaning is an environmental-friendly alternative for the cleaning of continuous materials, such as wire and cable, tape or tubes. The effect of the cavitation generated by the power ultrasound removes lubrication residues like oil or grease, soaps, stearates or dust. In addition, the pollution particles are dispersed into the cleaning liquid. By that, a new adhesion to the material to be cleaned is avoided and the particles are flushed away. Since the cleaning procedure is often a bottleneck in the wire production line, an efficient inline cleaning excels the traditional batch cleaning at various factors. The cleaning of wire coils in acid baths is is a non-continuous batch process – consuming time and chemicals. Additionally, it involves costs for the environmentally harmful acids. Cleaning the wire in-line with the other production steps leads to continuous production. Furthermore, speeding up the cleaning often enables the company to make full use of the capacity of the rest of the line. One advantage of the ultrasonic wire cleaning described above is the in-line cleaning. In comparison to the batch cleaning (such as acid cleaning baths) costs are reduced by decrease in necessary operating steps. In addition, the continuous in-line cleaning reduces the number of interruptions in the production process and with it the costs of stopping and starting the production line after each interruption. Today’s high-power ultrasonic wire cleaning systems serve to clean wires from contaminations at speeds of up to 30m/s. Since cleaning is often the bottleneck, this would increase the production capacity of the entire line and with it the potential output per year. Another benefit results from the continuous filtering and oil skimming of the cleaning liquid. This serves to hold the cleaning quality at a constant high level. This is particularly important in quality sensitive productions. In addition, high-power ultrasound saves cleaning chemicals. Thus, costs are reduced for purchasing and disposing the cleaning liquids. Filters and oil skimmers increase this effect by prolonging the utilization time. Better air conditions for the employees are the result of the lower concentration of cleaning chemicals. Together with the low power consumption and the highly efficient use of power and chemicals this is very favorable from an environmental perspective, too. The ultrasonic wire cleaning system itself is a long-life of equipment with low maintenance and operating costs.